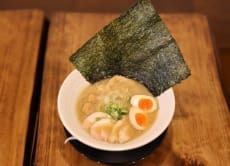 We are Ramen Yukikage, a restaurant in Asakusa specializing in chicken ramen. We opened it last year with friends. The 1st floor is the restaurant and the 2nd floor is our office and share house. Only 20 seconds from Kaminarimon and Asakusa Station. We are planning to offer some special experience in our restaurant and share house. If you are interested in our tour, please feel free to come and see us! Hosts were very kind and friendly. They gave clear and easy to understand instructions and the food was delicious. Highly recommend to all people who are interested in cooking.